Designer Kara Smith's collection of handbags is good enough to eat! It all started when she happened upon a piece of gorgeous fabric, begging to be made into something beautiful. 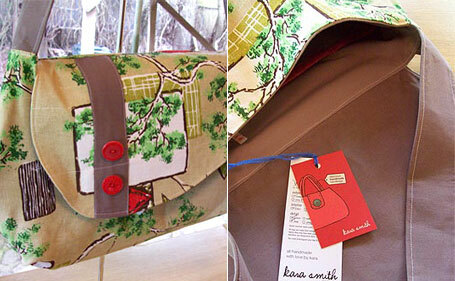 As she tucked it into her trusty yet tired-looking handbag, she resolved to transform that piece of fabric into a new bag for herself... From that first bag sprang many more, and the Kara Smith label was born. Kara lives in the Blue Mountains (about an hour from Sydney) where she creates a variety of handbags for all sorts of different purposes - every one perfect for the girl who wants to stand out from the crowd. 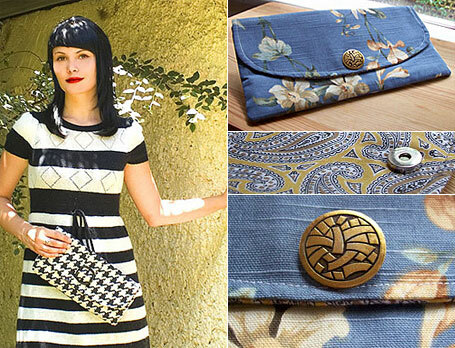 She uses 100% vintage & retro fabric, chosen for head-turning appeal, and adds gorgeous detailing including pockets, vintage buttons and recycled buckles (collected with an eye for the odd, delightful and the cute). The series of photos of the blue Bronte Clutch (right, top of post) highlights the detailing which makes her bags so special. The fabrics Kara has chosen are truly unique. I think my favourite bag is the Willow Tote pictured above. I just adore the print (nature enthusiast here), and the off-centre band with red buttons is a treat! Kara Smith bags are all individually named and Kara has grouped the styles into Small, Medium & Large sections on her website (www.karasmith.com.au) to help you choose! The geometric Odetta Clutch (above left, sold) falls into the Small bags section, as does the Germaine Clutch with it's fabulous original 60's screenprinted fabric (below left, AUD $62.95). The large Leonora Ballerina Tote (above right, AUD $119.95) is a beautiful creation with pale blue denim soft cotton contrasting against the careful folds of a pastel floral print. The Dottie Sue (below left, AUD $119.95) is another Ballerina style tote - but with a completely different flavour. This time spotted fabric from the 60's contrasts with red gingham used for the front pocket & detailing. Kara's medium-sized bags are currently on special, reduced from AUD $89.95 to between AUD $69.95 - $79.95. This includes the very retro Vesna (above right, AUD $69.95). Featuring recycled black and white gingham lining, a large chocolate button & warm, bold colours - it will be perfect as we come into Autumn! I must say I was really taken with the dreamy photos of Kara's bags with model Belle. Her photographer is talented UWS design/photography student Lisa Musico. I have no doubt I'll be featuring her photographs for a variety of design labels in the future! Pictured below is a screenshot of the Kara Smith home page - isn't the photo stunning?! 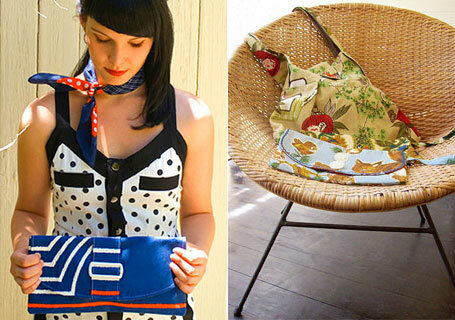 To read more about Kara's collection, you can also visit her blog, "Fabric Fantastic", at www.fabricgal.blogspot.com. Kara's bags are stocked in boutiques around Australia, and she will have a stall at the Rose Street Artists Market (Fitzroy, Melbourne) on 22.3.2008. She also takes customs orders, so if you have something already in mind, contact her through her web site at www.karasmith.com.au. NSW STOCKISTS: Handcut (Crows Nest), Todae Environmental (Glebe), Mrs Peel (Leura), Guanabana Designs (Cooks Hill), 76 Jam Cafe (Fairy Meadow). VIC: Arthur's Circus (North Melbourne), I Dream A Highway (Northcote), Meet Me At Mikes (Fitzroy), Lulu (Balaclava), Fanny's Flat (Talbot). ONLINE: www.karasmith.madeit.com.au, www.modamuse.com, www.leeloo.com.au, www.karasmith.etsy.com, www.neco.com.au.